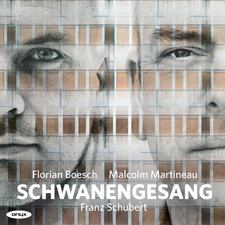 To complete their survey of the Schubert song cycles, Boesch & Martineau arrive at Schwanengesang, the set of 13 songs composed in 1828. These are masterly settings of Rellstab and Heine, and show Schubert at the very peak of his song-composing prowess. This recording excludes Die Taubenpost D956a, to words by Seidl, instead including five great settings of Goethe dating from 1815 to 1821.